Stephen Reverand came aboard David Walters Yachts with a lifelong love of boats and more than three decades of offshore and inland sailing experience. As a teenager, he restored a cedar-planked Barnegat Bay sneakbox and sailed local lakes in the New York area. As a young professional, he upgraded to a classic 35-foot yawl and sailed from New York Harbor, east on Long Island Sound to Block Island, R.I., still one of his favorite ports of call. Later he raised his family on the Chesapeake Bay catching bushels of blue crabs from his 22-foot center-console runabout. Most recently, Reverand cruised his 42-foot Tartan staysail sloop Zephyr over 10,000 nautical miles from the Chesapeake to New England to the Bahamas and back following the fair winds for more than four years. Before transitioning to cruising sailor and yacht broker, Reverand enjoyed a colorful career in the media. He served as a foreign correspondent for NBC News, spending six years in Asia. When he returned stateside, he joined the Discovery Channel where he oversaw the hit adventure series Deadliest Catch and received a Peabody Award for his work as executive producer on the documentary Black Sky: The Race for Space. Later, Reverand joined National Geographic as the head of nature films and specials production filming in many of the most exotic destinations around the globe. In keeping with his love of boats, Reverand also created, produced and directed the PBS television series Boatworks and wrote the long-running boating humor column Deviant Readings for BoatUS Magazine. 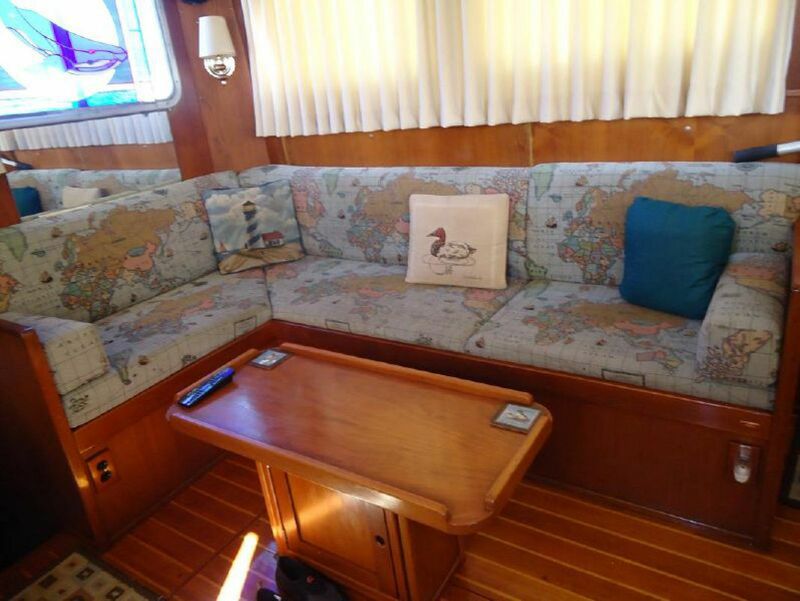 CANVASBACK, like all Wellington Yachts, is an exceptionally well-built and seaworthy ocean-going vessel. Her fully enclosed pilothouse with remarkable visibility in all directions includes a complete helm station with wheel steering and navigational instruments. In favorable conditions, CANVASBACK has a second helm station on her fly bridge with seating for at least six - shaded by a full bimini. With strikingly roomy accommodations, a full equipment list and shoal draft, CANVASBACK is truly ready for unlimited adventure. Fitted with factory installed full-flotation closed-cell foam in structural voids. Large walk-In engine room with full work bench and tool storage. Standing rigging upgraded with all new shrouds - 2017. New Mack mainsail 2017 and furler - 2014. New mattress in master cabin - 2017. Tabernacle-mounted mainmast simplifies river travel. 500 gallons each of fuel and water extends range to over 2000 nm. The centerpiece of CANVASBACK's accommodations is her tremendous elevated pilothouse which, in addition to the extraordinary helm station, includes a very comfortable, light and airy main salon that is perfect for entertaining. 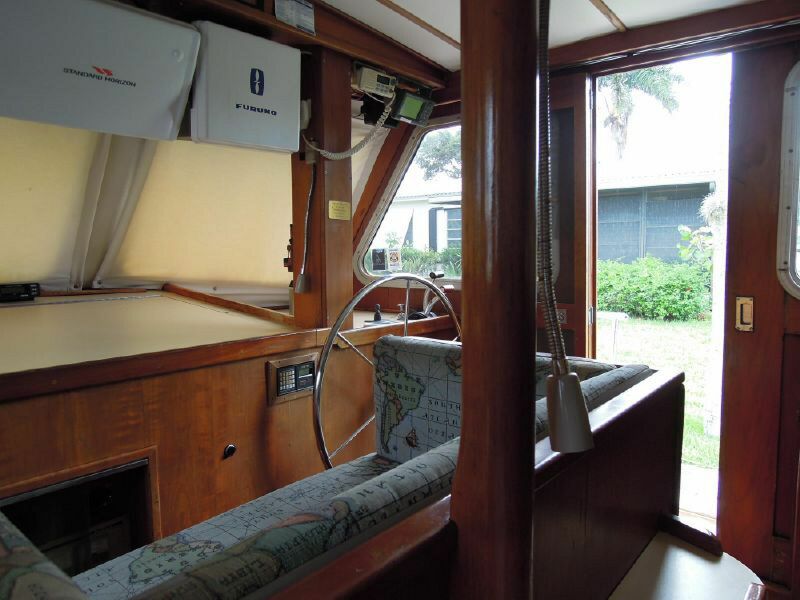 The pilothouse sole is lovely teak and holly in excellent condition. 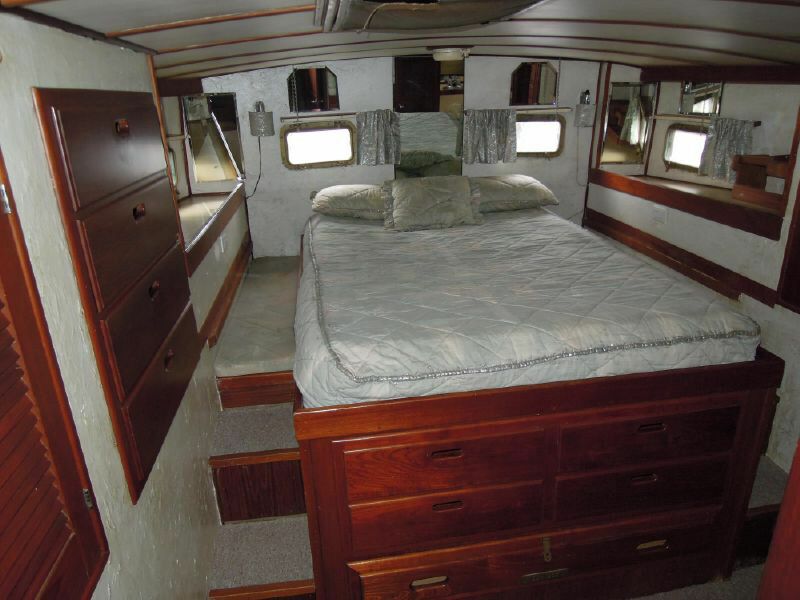 The master stateroom is aft down a stairway with a centerline full double berth and a separate head with a full enclosed shower. 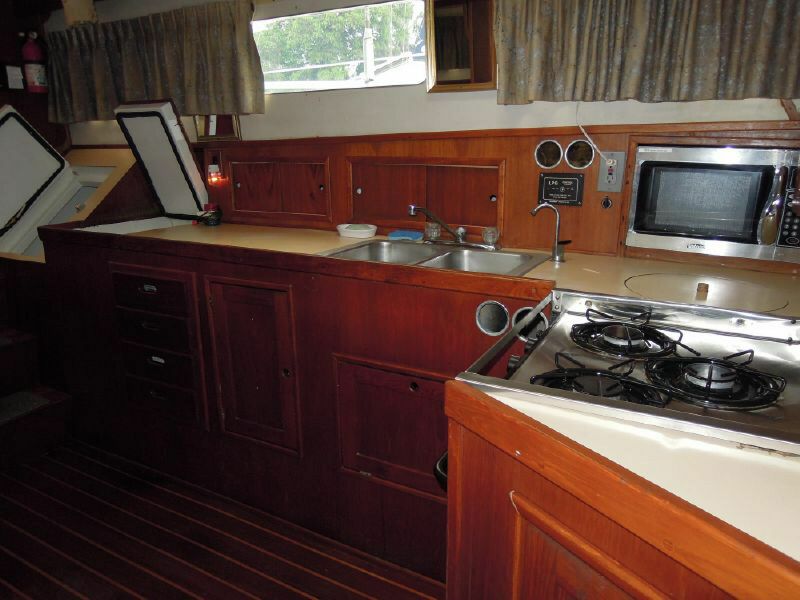 The galley is forward of the pilothouse with a huge dinette to starboard. The pilothouse and master stateroom are cooled/heated by 2 separate reverse cycle water-cooled units with a total of 25k btu output. Duct work is in place for a diesel heater that is not installed at present. 2 new 100 w flexible solar panels and controller. New upholstery and Sunbrella covers on flybridge. New upholstery in main salon. 2 New 8D house batteries. Northern Lights 8.5 kw generator rebuilt/rewound. New weather station an mount. Interior lighting replaced with LEDs. New 7" plotter on flybridge. New oil cooler and heat exchanger on main engine. Installed new fuel tank inspection ports. The full-sized walk-around engine room on CANVASBACK is accessed aft and a few steps down from the galley beneath the pilothouse. The passage way consists of a full sized work bench with tool storage and a bench mounted vice. 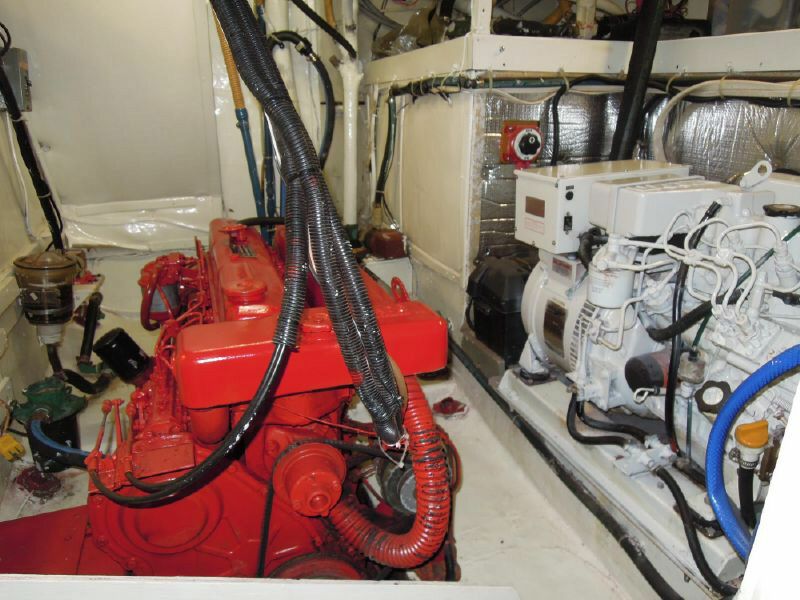 The 8.5 KW Northern Lights generator is also accessible from all sides just to port of the main engine. 12v fuel pump for changing oil. (2014) new pistons, injectors and injections pump serviced, new starter motor fitted, new 90 amp alternator fitted with splitter diode to charge house batteries and engine start battery. She runs beautifully! Comfortable seating for six to eight. 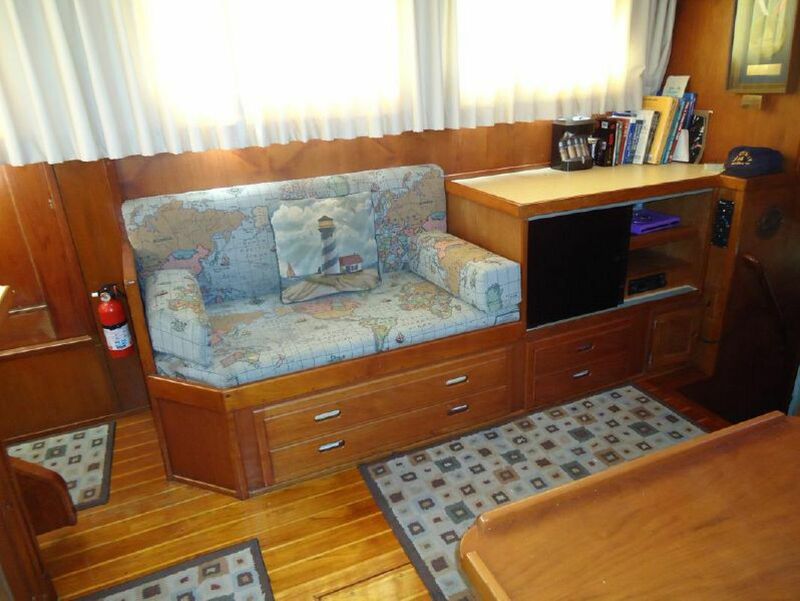 All new upholstery and covers for helm and seating. Sloop rigged with furling mainsail and genoa. Original and massive tabernacle allows mainmast to be lowered on deck. ICW friendly 56' mast height. Whisker pole mounted on mast track. 12v Ideal windlass with rope and chain gypsies (new motor). 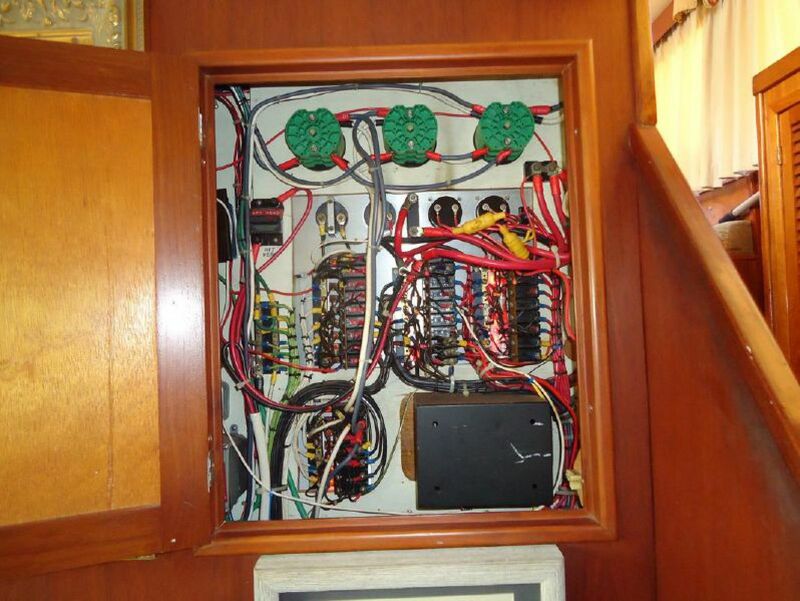 Windlass remote control on flybridge. New Rocna 25 primary anchor and 3/8" BBB chain. Delta anchor w/ 300" 3/8" BBB chain. Woods Freeman commercial grade autopilot. Standard Horizon GPS 500 chartplotter. ICOM M802 VHF radio with DSC and spare. Northern Lights 8.5 kw generator with 3000 hours in engine room. Dedicated 8D battery powers 12v Vetus bowthruster. 90 Amp alternator with splitter diode. 2 150w flexible solar panels and controller to be mounted on flybridge bimini. LED deck and running lights. 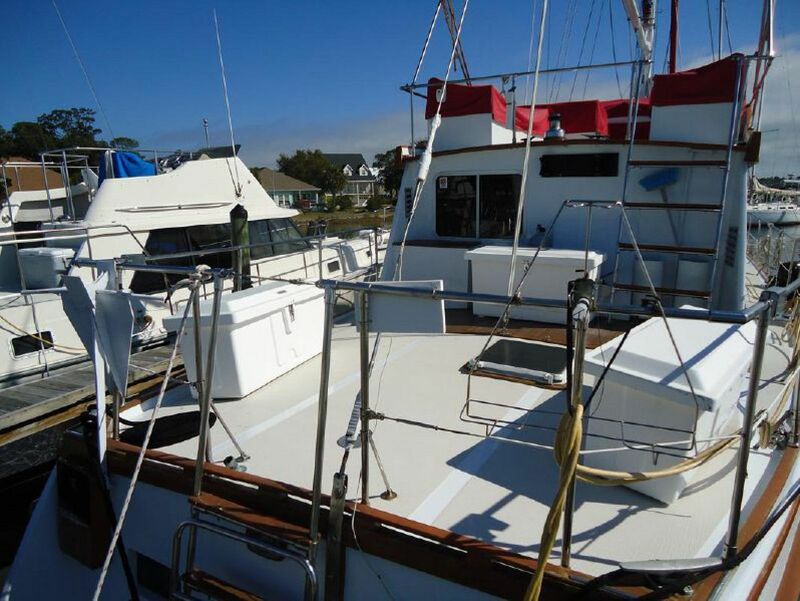 Huge aft deck for sunning and entertaining with bimini w/ two deck boxes. Integral swim platform with folding S/S ladder. Hot and cold FW shower. Solid S/S upper rail on lifelines. RHIB tender with 15hp Mercury outboard. S/S outboard hoist - New 2014. 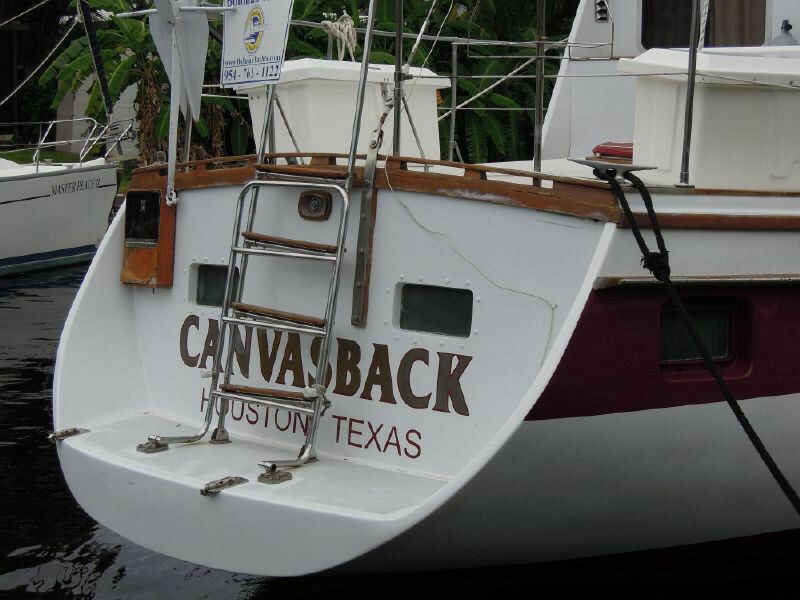 CANVASBACK is a true high performance motor sailor. 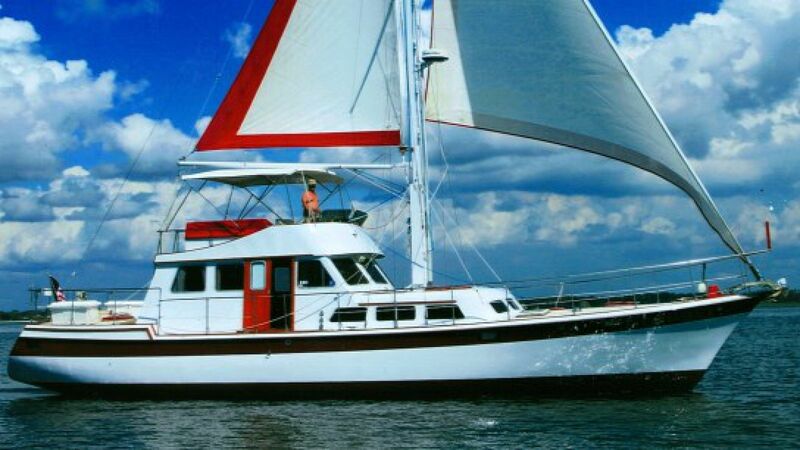 With the comforts, power and range of a large trawler, CANVASBACK is also an agile sailor in favorable conditions. Wellington Yachts built many of its yachts, including “Canvasback”, with a passive floatation option. 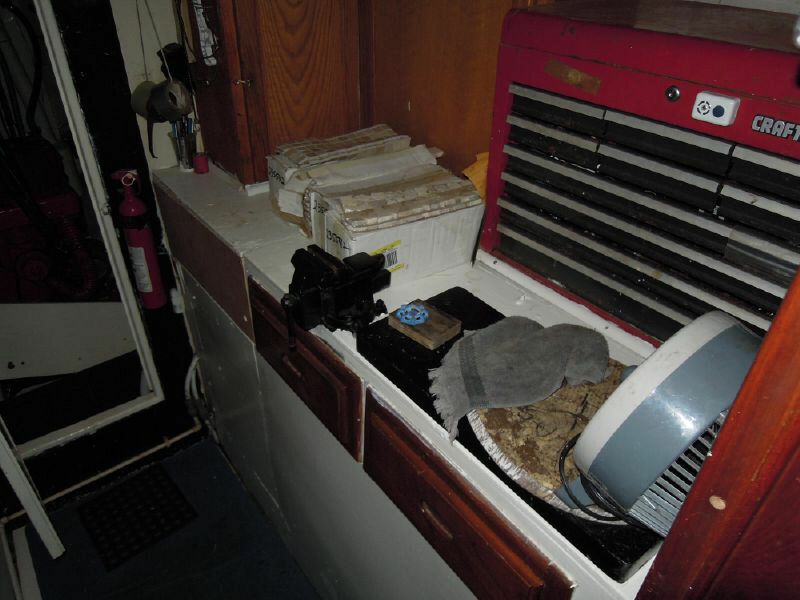 Using nearly 600 cubic feet of closed cell foam in all the void spaces, she was designed to remain afloat even in the case of being fully flooded. She would sink only 8”, leaving the berths and pilothouse dry and maintaining stability and sailing capability. 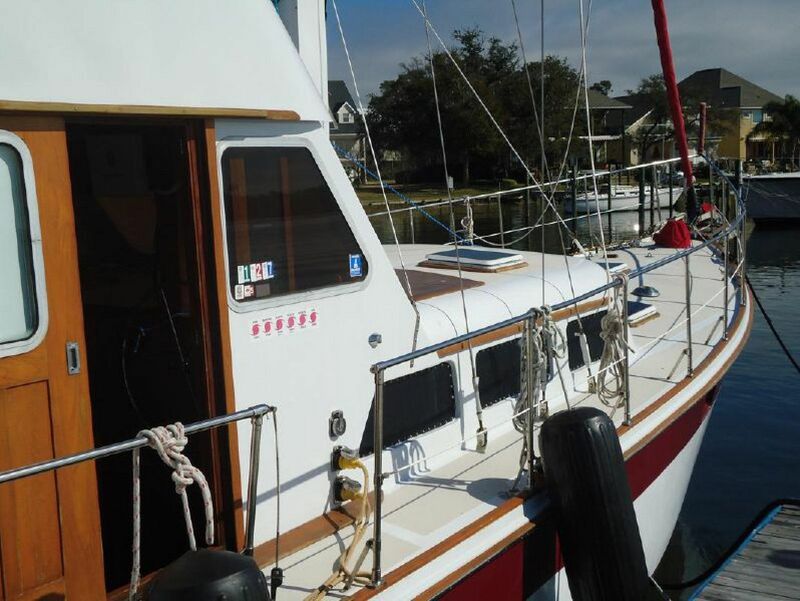 She has tremendous range under power, copious amounts of storage, and great accommodations in her 3 staterooms. At 7 knots, her range is estimated to be 2500 nautical miles. When motor sailing, she is quite extraordinary. 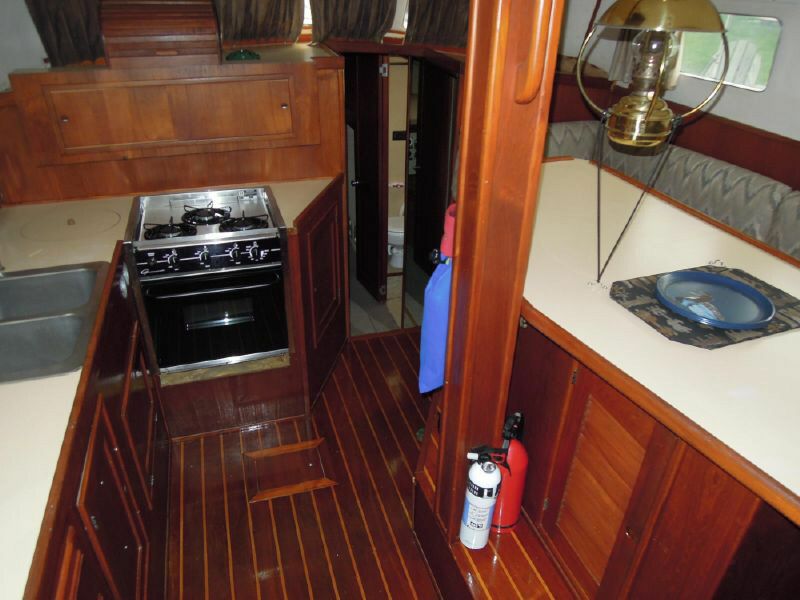 With a bit of wind on nearly any heading, from hard on the wind to a very broad reach, and the engine ticking over at 1200 – 1400 rpm, cruising speed is typically 8.5 – 9 knots; the boat is heeling just slightly and the ride is smooth, comfortable and quiet. Remarkably, at about 2100 rpm (still well below top rated engine rpm) the boat makes over 10 knots! The engine has demonstrated it has plenty of power to drive the boat into high head winds and seas with little loss of speed. In these conditions the ride remains surprisingly comfortable due to the long waterline and fine entry.